Nick Poole will end his near 20-year association with ice hockey in Milton Keynes at the weekend. 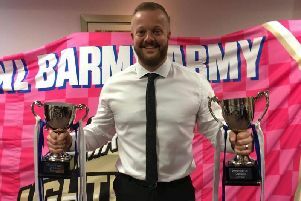 The former player, head coach and now General Manager announced his departure from MK Lightning in an emotional letter to the fans on Tuesday night. Poole moved to Milton Keynes in 1999 to play for the MK Kings for two seasons before the club folded. Poole in 2002 with the reformed Lightning as player-coach, and led the club to huge successes. Under his leadership, the Lightning won the league title for four consecutive seasons and were play-off champions three times, making MKL one of the EPL’s most successful teams. In the course of 456 games, Nick made more assists than any other player in the club’s history (463) and is the third-highest all-time goalscorer for Lightning (188). His letter read: "I would like to take the time to announce that I will be stepping away from the Milton Keynes Lightning at the end of this month. "It has been a fantastic period in my life but one that has reached its conclusion. I will look back fondly on some fantastic years with a club which I am proud to have created with Harry Howton and Vito Rausa. "When we started the club back in 2002/3 I would never have thought that I would still be involved with club to this day. The early years of the Lightning are a time in my hockey career which I found the most rewarding and enjoyable. Sure, we won games and trophies but it will always be the relationships, the spirit in which we played, and the bond of the group that I will remember. I know we created something in the Lightning that was special. It has given supporters great enjoyment and will carry on doing so. "A massive thanks to all the loyal supporters over the years who have been so positive and proud of what we were always striving for. Even in hard times your support was unconditional. It meant so much to me and I know it still does to all the players today. "I have enjoyed great relationships with so many members of staff at Planet Ice throughout my years with Lightning and junior club. Thank you for all your help on so many occasions. Mike Petrouis has been very supportive and helpful to me over the years and I am grateful. It is great to see the club that we started reaching a wider audience and this is something that could only be done now under Planet Ice's umbrella. I look forward to watching the club go from strength to strength in the future. "There are countless people who gave up so much time and energy to help the running of the club. From game nights, day to day running of club, transportation, housing and organisation. I will never be able to thank you all in person but know that it was always a team effort and your help and time was so appreciated. "To all the players I coached - it has been a privilege and I have learnt so much and taken away something from each of you. Thank you. I only hope you will look back on your time with the Lightning as fondly as I do. "Massive thanks to Harry Howton who has been instrumental in so many Milton Keynes hockey programmes. Whether Storm, Thunder, Hockey for Schools or Lightning, Harry was there at beginning. Milton Keynes hockey will always be grateful for your vision and support. "To my dear friend Vito (Rausa) - what a journey. It has been a privilege sharing it with you and I know you will be there on the next. Thank you!